September 11, 2018 – Vancouver, BC: Riverside Resources Inc. ("Riverside" or the "Company") (TSXV: RRI) (OTCQB: RVSDF) (FSE: R99), is pleased to have received the first set of regional soil geochemistry from the Cecilia 1 concession at the 100%-owned Cecilia Gold Project (the “Project”) in northeastern Sonora, Mexico. The soil survey covered approximately 30% of the recently acquired 50 km2 Cecilia 1 concession (see Figure 1 and press release dated March 5, 2018), and has expanded the targeting around the previously known central Cerro Magallanes area of the Cecilia Project. The Company continues to advance and refine the known central targets and is also placing equal priority on new property-wide target generation. The 69 km2 (6,897 ha) project tenure is located 40 km southwest of the Mexico-U.S.A. border and is easily accessible by paved highways and dirt roads. Since consolidating ground and expanding the property package significantly earlier in the year, Riverside has completed two sampling programs with the recently completed soils, rock-chip and channel sampling work continuing to deliver valuable information to guide ongoing targeting efforts. The soils have provided consistent gold, copper, lead and other indicator elements from the 518 samples collected from the survey. Riverside now awaits results from the rock channel sampling and outcrop assay rock program that was also performed at these target areas. This initial pass of soil survey was very broad, with lines 400 m apart and samples every 50 m along lines. From the soils, strong targets were discovered in the northeast called the Cruz targets where regional mapping has identified a strong regional fault structure and felsic dikes similar to other feeders to the main Cerro Magallanes dome complex. The fault and dikes appear to be potential feeder structures with high values of Pb, Zn and other elements typical of the halo over top of vein systems. The target looks very similar in geology to the Mercedes Mine, 100 km WSW from Cecilia which is operated by Premier Gold Mines and previously by Yamana Gold. At Mercedes they mined high-grade epithermal veins along fault structures which is a similar type of target Riverside sees at the Cruz targets. These NW trending structures run parallel to the Magallanes Fault at Cecilia Project (see Figure 1 below). There are identified adjacent conglomerates at the end of the Cruz targets, which stretch for more than 5 km. Riverside has found 2 gram gold rock assays with consistent gold mineralization and silicification in the conglomerate. The fault seems be a conduit for gold metals and felsic dikes with a halo of alteration and mineralization into the conglomerate creating the Cruz 2 Target. The Cruz 1 and 2 targets are linked over a 4 km long and 300 m wide potential drill target area. The soil anomaly is open in both directions beyond the 4 km and more than 800 m wide creating a large soil target. A second target area is the Casa de Piedra target with NE and a NW trends. The NE trend is a soil anomaly over 2 km long and 600 m wide with lead, silver, gold, zinc, antimony, mercury and small amounts of copper. The host rocks are the Upper Cretaceous age, Cabullona Group of siltstones and sands with lenses of conglomerate and interbeds of calcareous units. The rocks crack with faults and host veining displaying a series of NW striking feeder dikes immediately east of the main Cerro Magallanes. Riverside sees this anomaly as a large and potential part of a lateral expansion to the main Puma Dome and Cerro Magallanes making this a new target area worthy of further exploration at Cecilia. A third target from the soil survey is the East Mesa target area where soils have shown high gold values previously sampling over 1 g/t gold in soils (Precipitate Minerals, 2016, unpublished). Currently, the broad 400 m spaced line surveys have returned gold values consistently on multiple lines with a potential NS trending fault system of the Mesa Fault and intersecting Paleozoic limestones. This is similar to those hosting ores at the Cananea Mining district immediately 40 km to the west of Cecilia hosting extensive silicification over 60-100 m wide zones of silica alteration. The soils show an anomaly over 1 km long and 500 m wide with high values of Au and Zn with minor Ag, Cu, Pb and Bi. Regional government geophysics show this to be along the border edge (interpreted as a large regional fault “Mesa Fault”) of a magnetic high likely associated with PreCambrian granitic basement. This regional fault provides a large plumbing system for feeding potential of a gold epithermal target at the East Mesa target. The southeast corner of the concession has Palezoic limestones. The Llano target area contains high-grade gold samples in soils and alteration with jasperoid, silicification, and carbonate veining of the Paleozoic limestone that gives a potential limestone hosted gold with anomalous soil assays of Zn, Pb, Ag and Mn. In some regions further east this style of alteration and chemistry is found overtop of Carbonate Replacement Deposits of the large Zn deposit of Arizona Mining, the Taylor Deposit, occurs in a similar environment. Riverside’s soil survey has identified multiple areas of mineralization warranting further immediate exploration. The Cecilia Project historical exploration and drill data from the central claims show very favourable drill intercepts and disseminated gold results at surface. 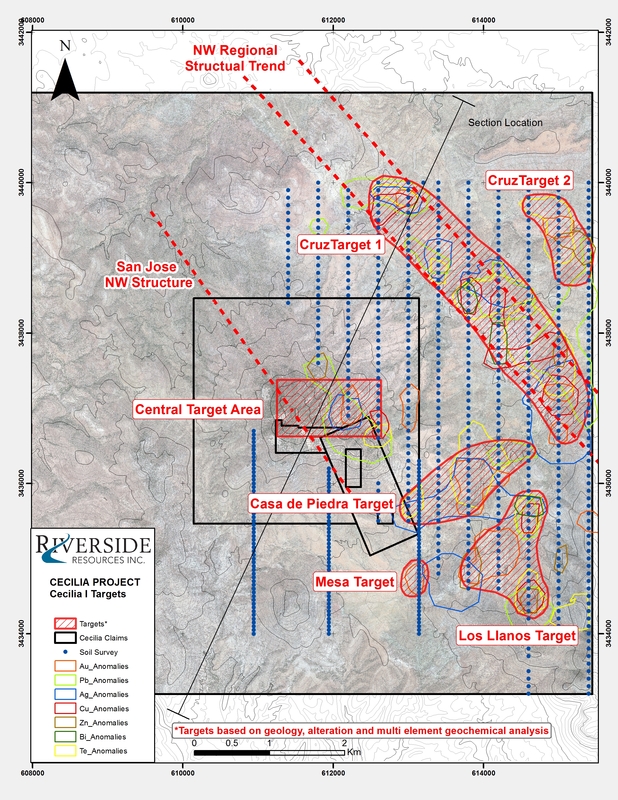 Riverside has now increased the land package significantly and completed multiple sampling and field programs with the intent of refining existing targets and generating additional ones regionally. The rock-chip and channel assay results are expected in the coming weeks. 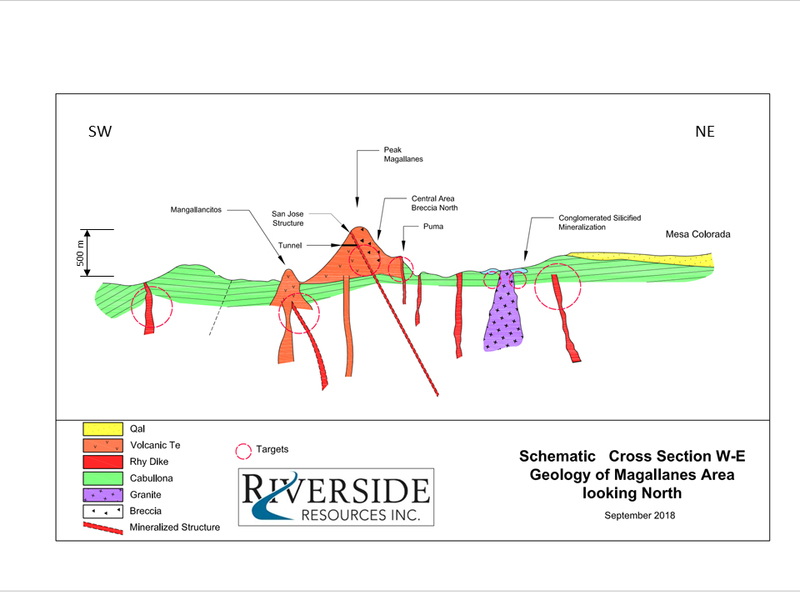 Riverside continues to engage in potential partnership discussions as the Company progresses the Cecilia Project towards a drill campaign. The scientific and technical data contained in this news release pertaining to the Cecilia Project was reviewed and/or prepared under the supervision of Freeman Smith, P.Geo., a non-independent qualified person to Riverside Resources Inc. who is responsible for ensuring that the geologic information provided in this news release is accurate and who acts as a “qualified person” under National Instrument 43-101 Standards of Disclosure for Mineral Projects. Riverside is an exploration company driven by value generation and discovery. The company has more than $2,000,000 in cash, fewer than 45M shares issued and a strong portfolio of gold-silver and copper assets in North America. Riverside has extensive experience and knowledge operating in Mexico and leverages its large database to generate a portfolio of prospective mineral properties. In addition to Riverside’s own exploration spending, the Company also strives to diversify risk by securing joint-venture and spin-out partnerships to advance multiple assets simultaneously and create more chances for discovery. Riverside has additional properties available for option, with more information available on the Company’s website at www.rivres.com.